Once again, my TILT is a little bit late, but I hope you’ll forgive me for just now coming out of my tryptophan coma — and for keeping it a little shorter this time around, since I’m trying to get this post up before my dad makes me put my computer away to eat dinner (yes, more eating). The incredible Annual Thanksgiving Dinner For People Without Home (as it’s casually called) — a regular event where my family joins up with a few other ones to put on a big meal for the local homeless, day laborers and a group of kids from the juvenile detention center in the hills near my parents’ house. This year, we fed 300+ people and it was as incredibly fun and gratifying as ever | I’m also very thankful for my adorable, amazing little brother for stepping up and taking his place as a lead organizer of the event this year. The family tradition continued very well with him! | Loving the Weight Watchers online tools + the incredible support I’ve been getting from everyone on Twitter, Facebook, etc. since I started this journey. Thanksgiving may have been a stupid week to start losing weight, but I’m 3lbs down already, so something must be working | Happy that the weather finally feels like fall. Love the excuse to bundle up and cuddle up | Thrilled to have finally jumped on the Google Voice bandwagon — it’s great to be able to make calls and send texts even though I’m deep in the cellular no man’s land that is Malibu | Looking forward to a great week of holiday-themed tech events – Digital Family Reunion, here I come! On the fourth Thursday of every November, Americans engage in an annual feast that reminds us of our country’s humble origins, and gives us a good reason to get together with family, watch football and stuff our faces until our pants don’t fit. It’s the official start to the holiday season, and it can either be a fantastic day full of food, family and fun, or a total nightmare full of burnt turkeys and busted travel plans. Wow, can’t believe it’s Thursday again already. Part of that is probably my day working from home on Tuesday due to some awful 24 hour stomach thing. Thank god that’s over. Now, if we could just get past the residual weather-changing stuffiness I’m fighting, I’ll be all good to go into the weekend. And thank god we’re only one day away from that. This week, I’m loving. . .
Grooveshark. Seriously, how did I not know this existed before? | Scarf and sweater weather. Love the chill in the air | Winter commercials coming back to the airwaves. I love all the Christmas and Thanksgiving ones, but the one that really gives me the warm fuzzies is the Mastercard one above. And yes, it has been known to make me tear up on occasion | This great New York Times piece about The Nutcracker’s history in America. Ever since I was a little girl making the yearly pilgrimage to see the Ventura County Ballet’s Nutcracker with my grandparents (whom I hold personally responsible for my love of theater, musicals, opera, ballet, etc.) Nutcracker has held a special place in my heart and this piece was a particularly fascinating sociological study of one of my favorite ballets | warm soup and bread on a cold fall night | finally having the willpower to get rid of all my leftover Halloween candy | Picking out recipes to make for our family’s Thanksgiving and the big Malibu Thanksgiving Dinner we help put on for those that can’t afford to have their own feast…I’m definitely feeling greens and squashes at the moment, so we’ll see what I end up cooking | The Cookbook Collector. I literally felt like crying when this amazing, intricately woven novel was finished. It was so good I never wanted it to end | Daily Worth, an amazing personal finance site for women that also sends approachable, engaging, informative emails about financial issues to your inbox every day. I can’t believe I actually find myself looking forward to a daily email about finances. My name is Mollie, and I have a problem. I’m addicted to frosting. My favorite is cream cheese, but really, any frosting will do. I love the texture, the taste, the way it melts in your mouth…man, I’m getting cravings just thinking about it. Of course, my status as a frosting fiend also translates to a deep and abiding love of cupcakes. And, when you combine those things with the opportunity to help raise money for charity and support Bakespace — a website I absolutely adore — you get one tasty treat indeed. Which is why I’ll be attending Cupcake Camp LA, a charity event sponsored by the aforementioned Bakespace to raise money for organizations like Angel Acres Horse Rescue, InvisiblePeople.TV and American Tortoise Rescue. For just $15 (and $5 for any kids under 5 I want to commandeer to come with me), I’ll get to taste unique cupcake creations from LA’s best bakers. And, I’ll get to do it knowing the calories don’t count, because the proceeds are going to charity. Or at least, that’s what I’ll be telling myself. 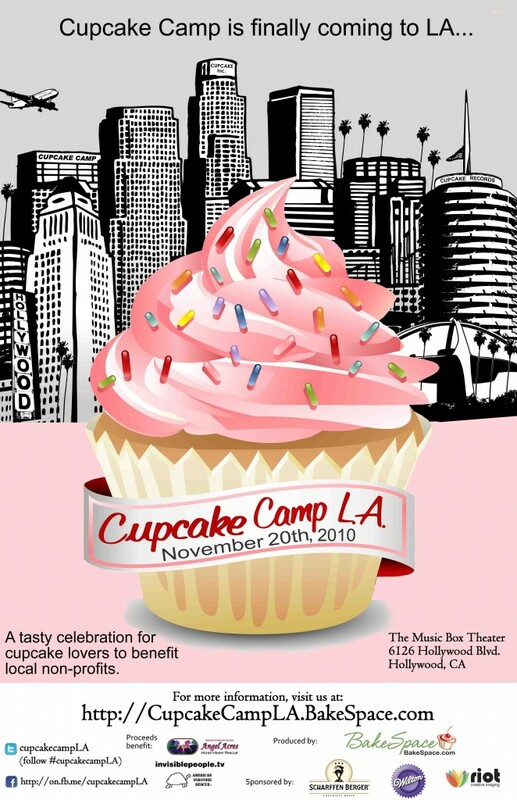 Join me at Cupcake Camp LA on November 20 by purchasing tickets here. See you there! (Just don’t try to get in the way of me + my cream cheese frosting). Klout Score Analysis: I Klout, Therefore I Am? According to Klout, I am a specialist. “You may not be a celebrity, but within your area of expertise your opinion is second to none. Your content is likely focused around a specific topic or industry with a focused, highly-engaged audience.” I have a Klout score of 48 and a true reach of 267. That data may not mean much to most people right now, but I’m firmly in the camp that says these stats will soon become the go-to barometer for brands looking to target their marketing and outreach efforts to influencers based on … well, influence. Not to mention social media teams trying to prove the power of their campaigns, and all sorts of other uses as well. Of course, as anyone with actual social media experience (and no, I’m not talking about the ‘experts’ and ‘gurus’ who think that being able to successfully bot and spam their way to 1,000 Twitter followers makes them qualified to consult about social media for a living), will tell you: the numbers are great and all, but in the end, quality will always matter more than quantity. Whether it’s the quality of your interactions with your followers, the quality of your expertise in your field, the quality of the links you curate or a combination of the three, people will always reward quality over quantity. So, while I’m happy that my Klout score seems to be pretty decent and growing with every refresh, and while I totally been geeking out over the accompanying stats, I know it’s not everything. This weekend, I hit the 2,000 Twitter follower mark. Not gonna lie, that was pretty cool. But, what’s even cooler is that I can go down my list of followers and pick out plenty of names of people who I actually interact with on a regular basis and who I count amongst the many voices that help make my days better, richer and more interesting. Thanks to Twitter, not only do I now have the ability to broadcast my social media messages to 2,000+ people, I also have the ability to listen and learn from all of them, plus the people I follow as well. Which of course is what social media really should be about. So, while Klout may provide some amazing metrics for marketers to better hone in on their core audiences — a path the brilliant Peter Shankman outlined very well recently — I hope those marketers (and the users they’re marketing to) remember that the quantity of someone’s scores and stats is a good way to narrow down your focus. But, it’s the quality of their overall social media stream that really tells you who is worth focusing in on. I’m deep in the middle of about a million things – more details to come shortly, I hope – so this week’s Things I Love Thursday will be short & sweet. Just like me (most of the time). Having Halloween candy in the house | the awesome new Loseit.com interface, which is making it very easy to enjoy picking at that candy guilt-free | Paying off one credit card in its entirety, and being just a few months away from being totally debt-free (so long college debt, I won’t miss you!) | The video for Tighten Up, by the Black Keys. Love them. See above for why | Daylight Savings this weekend, and a return to the winter schedule I love (although I am SO over this weird LA heat wave) | Hashable, which is one of the coolest Twitter apps I’ve seen in a while | Having tickets for our next GIT LA event be completely sold out with more than 2 weeks to spare (don’t worry, you can still see the panel on our first ever livestream | Salt & vinegar PopChips. Noms | Planning to go to The Kings game Saturday night | Looking forward to a relaxing, recharging weekend.